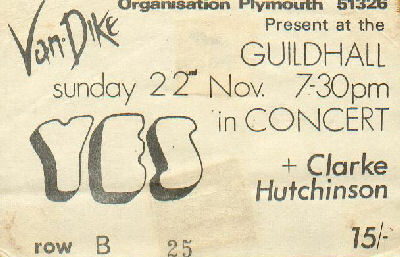 Although this gig was promoted by the Van Dyke Organisation, it actually took place at the Plymouth Guildhall. I will post the ticket for 15 shillings if I can work out how to do it. The set was mainly Yes album stuff but Bass Odyssey and America left a lasting impression. The Yes Album wasn't actually available at the time, nor was the merchandise, so I bought a Time and a Word poster to satisfy my hunger(which I still have). I remember travelling up from Cornwall to Plymouth to by the album in February 1971 'Peter Russell's Hot Record Store'. There wasn't a decent record shop in Cornwall at the time that I was aware of, although you could order them from some guy called Richard Branson who was running a record mail order service by the name of Virgin. We had seen the band previously (around July 1970) at the Penzance Winter Gardens (hip name 'the Garden') after Steve Howe had just joined the band and they had finished rehearsing. This gig is not listed but definitely took place. The audience was small but we were blown away by songs of the like we had never heard before such as 'Yours is No Disgrace'. Steve Howe did 'the Clap' so it was nice to hear it again, this time with Asia at the Carling Academy, Liverpool, last Tuesday 4 March 2008!